New screenshots and a clown trap video. 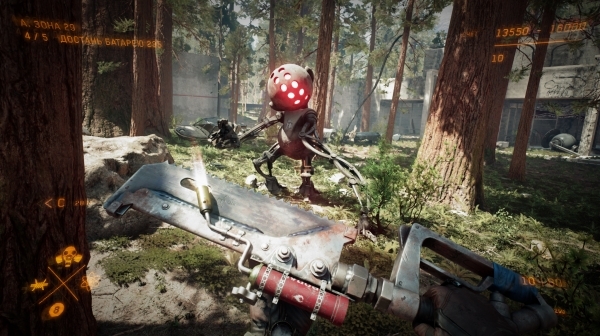 The Soviet Union-set first-person shooter Atomic Heart announced in May will launch in beta across PlayStation 4, Xbox One, and PC in Q4 2019, developer Mundfish announced. Release dates and priorities will be announced in Q2 2019. Atomic Heart is an action RPG with FPS elements set in the alternate version of the USSR. Technological revolution powered by Communism has already happened: robots, the Internet, holograms, and other futuristic stuff make everyday life of the Soviet citizens better and brighter. These great technological advances are made at special facilities placed all over the country. The world of Atomic Heart consists of several regions with different biomes. On the surface and under the ground, you will meet exotic mechanical creatures designed to serve the needs of people, which for some reason turned into combat-ready killing machines. Watch a new video featuring the “clown trap” mechanical creature below. View a new set of screenshots at the gallery.